Father John Caskey, Galveston's Pied Piper. Church going and memberships seem to be in direct proportion to how scared and overwhelmed people are. When World War II ended and the Boys returned home, heroes every one of them, hoards of people thought their prayers had been answered, even whether or not the answer for them had been “yes” or “no”. Many thought it was time to become less serious about life, have fun and resume family life. And with that came the predicted decline in church membership and attendance. There was a blip of resumption when the Korean War began in the middle of 1950, but that conflict never reached the magnitude of World War II, and by July of 1953 it was over. Ike was president. Everyone thought he’d protect us. No need to pray about that. 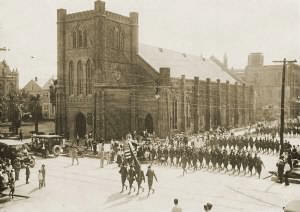 Galveston’s Trinity Episcopal Church had been under the leadership of its rector, Edmond H. Gibson since 1928, by then, and not only were Trinity church goers somewhat lethargic, but honestly it didn’t seem as though there was much rah-rah going on in any of the Galveston churches. John Caskey was the 25-year old son of a Wichita Falls doctor and his wife. By the time he was 16, he was on his way to becoming the youngest person who had, thus far, ever enrolled at the University of Texas Medical Branch. He was going to be a physician. But in advance of that, as a student at Baylor University, he began ministering to students, figuring out ways to get them involved in the activities of the Episcopal Church. All the while, he was working as a radio announcer and as a lab instructor for the school’s chemistry department. By 1951, he had abandoned the plans to be a physician, and had moved to Philadelphia to get his Theological degree. He hit Galveston running and was ordained to the priesthood. He was 25-years old. Caskey’s plan was to minister to residents of the island through their children, with every hope and expectation of converting large numbers to the Episcopal denomination, and to get those who were too hard headed to follow his leadership, to become seriously active in their own churches. Children loved him, the young priest with the deep voice, friendly smile, and who could easily call each of them by name. He found many ways to involve them, ways that made them want to learn to love their church. They certainly loved him. He dreamed up Teen Town, and it was big. Every Saturday he had sock hops for the Galveston kids, regardless of denomination, in the big Eaton Fellowship Hall. Hundreds came. Other mainline churches saw their own teenagers gravitating toward Trinity and John Caskey, so they were forced to try to match his activities and influence. 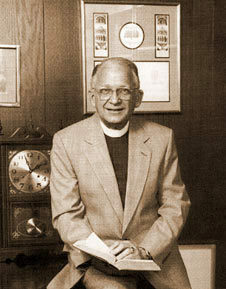 He insisted that Trinity begin an elementary school, so in 1952 Trinity Episcopal School was born. Parents followed their children who were following Trinity’s Pied Piper. Membership grew, attendance increased. Those from other Christian denominations joined, and a surprising number of Jews chose to follow Caskey as well. And most stayed. In 1955, he left Trinity to become the third rector of St. Cyprian’s Parish in Lufkin, but that acceptance came with a caveat. They had to agree to build a school. He went to the Scottish Rite Hospital in Dallas to learn how to teach children with a little known disability called dyslexia. St. Cyprian’s Episcopal School became renowned for its special programs. Most living in Galveston today know John Caskey as the executive director of the William Temple Foundation and vicar of St. Luke’s the Physician, the position he held from January 1, 1978 and continued to influence until he passed away in 1997 at age 70. But it was the first four years of his priesthood that did the most to influence the direction Galveston churches would follow. For me, that’s arguably his Island legacy. It seems a shame that Fr. John Francis Caskey didn’t leave behind a written primer of how to build and retain church membership and loyalty. Those of us who were “his children” when he was the young associate rector of Trinity are a great deal of what we are because of him. Our parents and friends are, too.